In a triumphant celebration at its global conference in Hamilton Island, Australia, esteemed business coaching firm ActionCOACH celebrated its 25th anniversary with a fitting amount of pomp and circumstance. ActionCOACH has a lot to be proud of with its expansion into new markets and the success of its coaches around the globe. Las Vegas, NV, August 16, 2018 — In a triumphant celebration at its global conference in Hamilton Island, Australia, esteemed business coaching firm ActionCOACH celebrated its 25th anniversary with a fitting amount of pomp and circumstance. ActionCOACH has a lot to be proud of with its expansion into new markets and the success of its coaches around the globe. The growth of ActionCOACH is evident in the burgeoning size of its number of coaches and expanding global footprint. Last year, ActionCOACH expanded its reach further with the addition Nicaragua, Paraguay, El Salvador, and Azerbaijan. This extends its presence to a total of more than 70 countries, and with their eyes set on expansion into at least seven new countries over the next few years, the future looks brighter than ever for ActionCOACH. In addition to awarding several new Master Licensees this year, ActionCOACH reported hiring an additional 293 coaches worldwide in the 2017-2018 season. ActionCOACH was started in Adelaide, Australia by Brad Sugars in 1993. His foray into serial entrepreneurship began at a young age. While still in grade school, he sold newspaper routes to friends, who would then perform the work for him. By the age of 20, he had started and sold several startups, and leveraged his experience as an entrepreneur and teacher to start ActionCOACH. From its humble origins in a single office, ActionCOACH has grown to become one of the largest business coaching firms in the world. 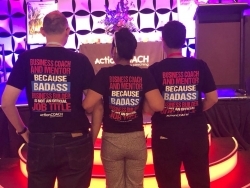 ActionCOACH, the world’s largest business coaching firm, was established and founded in Brisbane, Australia by Brad Sugars in 1993 when the concept of business coaching was still in its infancy. Since franchising the company in 1997, ActionCOACH has helped business coaching become more mainstream and has grown the company presence in more than 70 countries. ActionCOACH specializes in coaching small to medium sized businesses as well as executives, and their teams. ActionCOACH maintains its growth and strategic alliances by continual development of cutting-edge innovative technology, proven business processes and systems to add value, satisfaction and additional income streams for its franchisees.